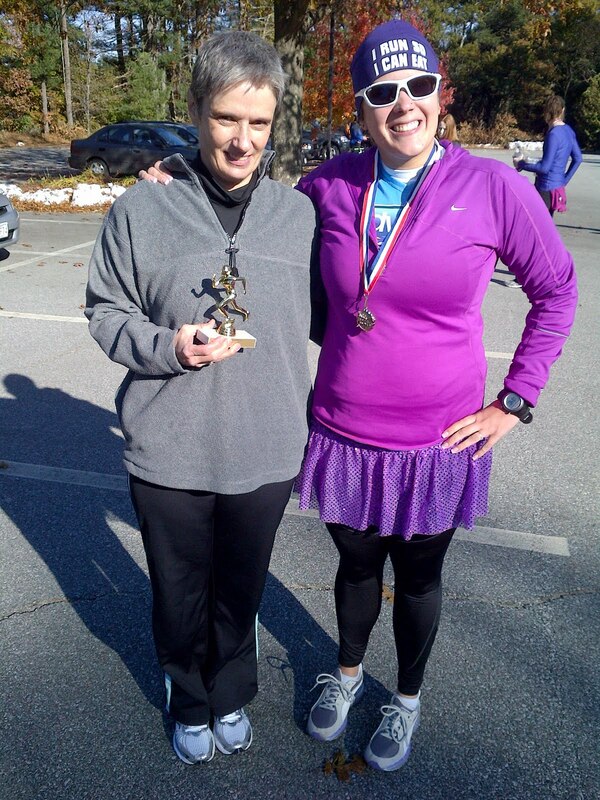 Saturday 5 Nov was the second year I put my toe to the line of the 5k for Pre-K. This race is TINY! They allow no registration online the only pre-registration is to drop off at the church where the preschool is that they run the race for in Holliston, MA. So obviously registration day of is popular. It is a cheap race at only 20 bucks for registration. There is no race shirt just a simple number no chip. Kinda nice. And super local. I grew up pretty close to the start line so my parents were up for racing too. Mom did it last year and won her age group. D raced last year and placed in his age group too but this year a duathlon rescheduling caused him to decide against a double race weekend. Dad decided to join us this year even though he was doing the same duathlon as D (his first) the next day. Last year my time on the course was probably my slowest 5k. Mind you I was 2 months in to being able to run again post surgery and this course is no walk in the park. It is possibly one of the hilliest courses for a 5k I have ever done. It starts at the bottom of a hill and ends with a nasty climb. Since I knew the course was gonna be tough I just wanted to beat my time from last year and have fun with it. Dad offered to help pace me to beat my time from last year. I wanted to be sure I had enough in the tank to make it up that last hill so I told him around 10s- knowing I could probably do better than that. 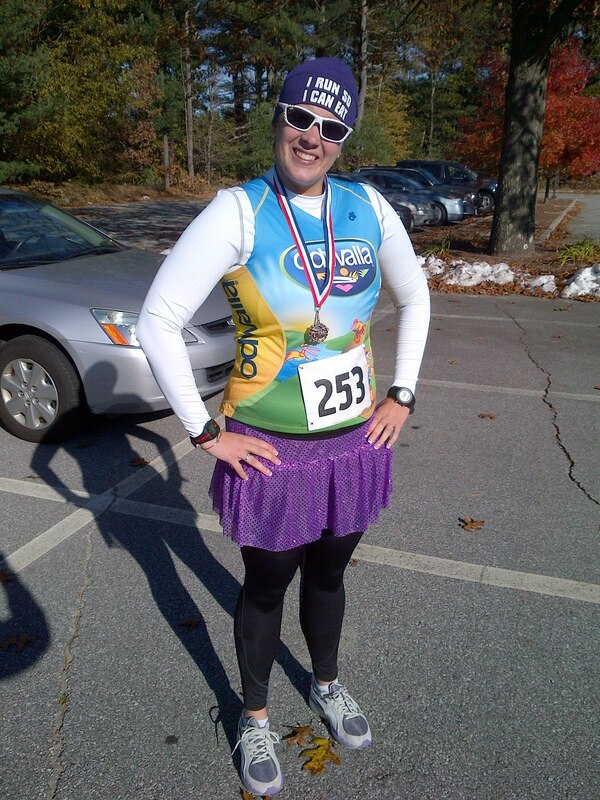 And as for having fun- I raced my first race in my Team Sparkle skirt. I made a decision a couple weeks ago to buy my first skirt and join the team when I realized all I was going to be doing was running races for a few months. I am not a fan of running races. I always feel so slow so I wanted something to add a little fun to it. The #sparkle added a lot of fun. I got lots of compliments! Dad and I ran the first mile in 9:24- not bad did I mention it starts UPHILL! The plan was to try to stay around a 9:30 now for the rest of the race. Mile 2- 9:41- well a bit off. The last mile of this course is the worst mostly up hill with a killer hill at the end managed a 9:49 pace. Worked out to a finishing time of 29:58 with a 9:36 pace. Crushing my previous course time by 3 minutes! Mom managed to stay right on Dad and I's heels so she finished 30 something also beating her time by 3 minutes from last year. This race also has a lovely tradition that the parents of the preschool make baked goods for all the award winners. There is a table full of goodies that you get to take a WHOLE plate of cookies, brownies whatever after accepting your award. They also did a fun little raffle. The times weren't posted when they started awards we were all hoping Mom would repeat her AG win. WHICH SHE DID! GO MOM! The 18-39 age group- I know HUGE age group- was called and I couldn't believe it when they said 3rd place- ME!? I was in total shock! I have never placed in a running race. I have never gotten a medal at a running race that wasn't the medal they gave everyone who crossed the finish line! I think my #sparkle may have helped. Coach told me it is all the hard work of the season paying off. I have to say I have worked hard and I am glad I could wear my skirt and have a little fun too! Side note: the rest of the weekend I was support for D and Dad's duathlon. It was Dad's first and he went all in with a costume for the Halloween themed race. D ended up doing great with a new course PR and got 4th in his AG. SO PROUD! I think Dad has a new found respect for multi-sport events. Maybe we can shame him into actually training to do another next season! My friend Julia was there too- she rocked out a 2nd place OA female award- WTG Jules! Congrats on the podium finish! And I can't wait to see you for the Hot Chocolate 15K - we'll be purple sparkly twins! Congrats on placing in your race!